Golf towels are small sized towels that are used by golfers when playing on the course. Absorbency is important when selecting wholesale golf towels. Another important factor is choosing cheap golf towels that can be attached to a golf bag. At TowelsOutlet.com, we have tri folded golf towel designs that have a grommet and hook for easy attachment to any golf bag. When providing golf towels for your guests, quality and price are important factors to consider. You will find high quality wholesale golf towels at discount prices in our catalog. 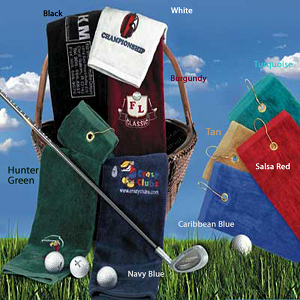 We offer a great selection of colors in tri fold golf towel designs with grommets and hooks. Eleven color choices are available and custom embroidery options allow you to create a custom design for your golf towels at an affordable price. Select custom embroidery for a personalized embroidered golf embroidered for your establishment. On the tri fold golf towel product ordering page, choose the color for your towels and provide information about the text and image designed for custom embroidery. Upload your logo or choose one of our stock images to create unique golf towels. The prices are listed on the product page for plain golf towels. For custom orders and for embroidered golf towel designs, complete the details of your order and embroidery requirements to receive an accurate price quote that includes embroidery. All our cheap golf towels are made with quality materials and shipped quickly from our Miami facility with fast, quality customer service.